Burlington County Animal Alliance is urgently seeking new foster homes for its dogs. BCAA is a non-profit organization whose sole purpose is to rescue animals that have been in bad living conditions and give them amazing new homes with loving families. The only way it is able to rescue so many animals and get them adopted is because of its amazing network of fosters. 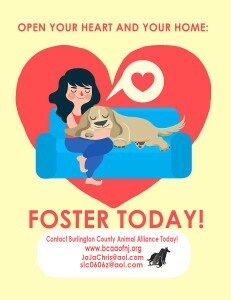 BCAA has no shelter and relies on fosters to give them a nice temporary home until they are adopted. Being a foster mom or dad is such a rewarding experience. You can foster puppies, moms with puppies, older dogs and dogs that may need special care. All bills and expenses are paid for, so no money comes out of your pocket, This allows you to experience having a pet while not having to worry about paying for one. Fostering is a great opportunity to give back to your community as well, and is a fun way for teenagers to get their service hours for school! Fostering saves the lives of these dogs who would have never survived if BCAA did not take care of them. If you are interested in being a foster, want to see some of the BCAA dogs or are looking to adopt, visit the the Petsmart in Centerton Square in Moorestown every Saturday from 10 a.m. to 2 p.m or email BCAA at slc0606z@aol.com.